You'll see everything you ever imagined along Virginia Beach's famous boardwalk. Sidewalk entertainers, amusements, free concerts, gift shops, restaurants, and much more! A "must do" on your vacation. 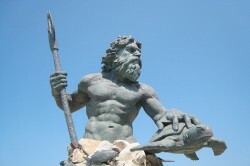 Virginia Beach's newest attraction is King Neptune, a colossal 34-foot-high bronze statue that rises from the depths of the Atlantic Ocean at 31st Street & Atlantic Avenue, overlooking Neptune Park. Volunteers with the popular annual Neptune Festival wanted a statue that honored the festival — now in its 33rd year — as well as the City of Virginia Beach and its citizens. They raised private funds and commissioned Richmond artist and sculptor Paul DiPasquale, who not only designed and created the massive statue, but accompanied it to China, where it was cast in bronze. In 1891, a community that would later be called Virginia Beach, came together to fight a calamity off our shores, and the heartfelt gratitude as a result of that endeavor would be recognized on the other side of the world, even today. On March 28, 1891 the Norwegian vessel Dictator, needing vital repairs and caught in a storm, ran aground on a sandbar 300 yards from the shore. This location is present day 37th street here in Virginia Beach. The two life boats on board were destroyed when the mast and rigging fell on the deck. Local residents, patrons from a nearby hotel and men from two nearby United States Lifesaving Services (now called the United States Coast Guard) braved the raging storm and tried to rescue the ship's valiant crew. The crew aboard and local inhabitants worked together trying many different methods of rescue. They even used the breeches buoy system, but unfortunately, only 8 of the 17 were rescued. The casualties included Captain Jorgon's pregnant wife Johanne, his four year old son Carl and five members of his crew. The captain himself washed up on the beach in a semi-unconscious state and lived to return to his beloved Norway. Seven of his crew were buried in Norfolk at Elmwood Cemetery, while the remaining crew members, having washed ashore days later, were buried at a closer location near the Oceanfront. A young boy walking along the beach found the female figurehead from the Dictator. Hearing the discovery, the manager of The Princess Anne Hotel went to secure the figurehead before the ocean would carry it away. As a testament to those who helped in the rescue, as well as those who perished, the manager had it vertically positioned on the boardwalk. Over the years she became known as the Norwegian Lady. Local lore had the Captain returning to the Norwegian Lady in Virginia Beach for many years after his incredible loss, flowers in hand and tears in eyes, to remember that dreadful and terrible day. The Norwegian Lady stood as a guardian to those memories for over 60 years. In 1953, Hurricane Barbara damaged the Norwegian lady beyond repair and she was removed from the site. Word traveled to Norway about the loss and a joint venture was sent out to raise the funds to build a new memorial. Hearing about the interest, the Norwegian Shipping Association raised enough money, not for one memorial statue, but for two. The renowned Norwegian sculptor Ornulf Bast was commissioned to create two-nine foot replicas of the original figurehead, being completed on September 22, 1962. 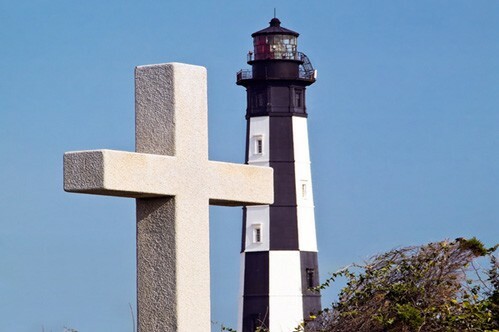 One was given as a gift to Virginia Beach while the other was erected in Moss Norway, forever linking the two sister cities together. The two statues are positioned to face one another over the Atlantic Ocean. Both are a tribute to those who died, as well as those who faced peril in attempting the rescue. Each year the Ladies Auxiliary of the Virginia Beach Volunteer Fire Department places a memorial wreath at the base of the statue to remember that anniversary. In 1995, on an official state visit, Queen Sonja of Norway visited the Virginia Beach Norwegian Lady and gave tribute by placing flowers on the site. Needless to say, we have sent our own Virginia Beach delegation to Moss Norway to pay our respect to the friendship this disaster forged. To pay your respect, you can visit the Norwegian Lady located at 25th street and Boardwalk. Most of us have seen the Norwegian Lady but never connected the true meaning. I invite everyone this summer to stop by the statue, but also to read the words that are inscribed there: "I am the Norwegian Lady. I stand here, as my sister before me, to wish all men of the sea safe return home." Journey back into the 18th-century in this gracious colonial town. America's oldest and largest live interpretive history experience, Colonial Williamsburg's 301-acre historic district brings Virginia's capital city back to life! Visit with farmers, debate the "issues of the day" with a founding father, take a carriage ride, watch the tradespeople, merchants, and artistans re-enact their everyday lives, stroll the cobblestone streets, visit the shops, and dine and drink in the taverns where Thomas Jefferson, Patrick Henry, George Washington, and others conceived the ideals of liberty and freedom. Also explore the beautiful elegant formal gardens of the past. Call 800-447-8679 for information. Mt. Trashmore is one of the earliest parks in the country to use technology to build fun from a trash heap (abandoned landfill). The park is open 7 days a week from 7:30 a.m. until sunset. Built in 1978, it spans 165 acres and includes four large and eleven small picnic shelters, playground areas, a basketball court, four volleyball areas, parking, vending machines and restrooms. also has a competition-sized vert ramp over 13 feet tall and 40 feet wide. The Kids' Cove playground at Mount Trashmore is an innovative playground designed for children using children's ideas and input. The playground, which is handicapped accessible, was constructed totally by volunteers and coordinated by the Virginia Beach Jr. Woman's Club. Adam Thoroughgood arrived in Virginia in 1621 as an indentured servant and in 1636 was granted a land parcel. It was thought the house dates circa 1680 and was probably built by one of his grandsons, although recent archaeology suggests it may have been built as late as 1720 (Davis, Marc. "For one man, house's age is much more than just a number". Adam Thoroughgood House / Dispute. Virginian Pilot: July 5, 2007). The Francis Land House is a two hundred year old plantation home, built circa 1805 - 1810 in the Georgian style, that is open to the public six days per week for guided tours. The Land House was purchased by the City of Virginia Beach in 1975 and has been operated as a historic house museum since 1986. Its gambrel roof harbors original interior paneling, floors and period furnishings. The beautiful and award-winning landscaped gardens have been lovingly maintained by local garden clubs. Special programs for schools, scouts, and the general public are offered throughout the year. Built around 1725, Lynnhaven house is an example of 18th century Tidewater Virginia vernacular architecture and retains about 85% of its original story-and-a-half structure. Constructed of brick in the English bond pattern, Lynnhaven House sits on a finger of land near the Lynnhaven River. For many years, this house was referred to as the Wishart House or the Boush House. Upper Wolfsnare is a historic home that was built by Thomas Walke III in 1759 and is on the National Register of Historic Places. This majestic brick Georgian home had fallen on hard times when it was rescued from demolition by local citizens and the Princess Anne Historical Society. The House is occupied by live-in tenants and is therefore open on a limited basis for Society Events & Special Occasions. Open to the public for tours on Wednesdays during July and August. 757-491-3490 for more information or to arrange special group tours. Dining, shopping, and pure entertainment! Browse through unique shops, enjoy great food and entertainment, music, comedy, karaoke, and dancing! Or stroll outside to watch the passing ships. Downtown Norfolk. (757) 627-3300.